The Bescor CLC-125 Cigarette Adapter for LED-125 Camera Light powers the Bescor Morning Star LED-125 Camera Light by connecting it to a Bescor battery pack. One end of the CLC adapter is a 12V barrel connector that plugs into a 12V input port on the LED light. The other end is a cigarette plug that connects into one of three Bescor 12V battery packs -- the HP3, MM7, or NMH54. The moment the CLC adapter connects the LED light to a battery pack, the LED light stops using the power of any AA batteries that may at the same time be in it. So the AA batteries don't need to be removed in order to be preserved when switching to a battery pack. The battery packs are carry-on or waist-belt packs, and the CLC adapter is six feet long, so comfort exists when maintaining a connection between a battery pack and the LED light. Connects Bescor Morning Star LED-125 camera light to HP3, MM7, or NMH54 Bescor battery packs. 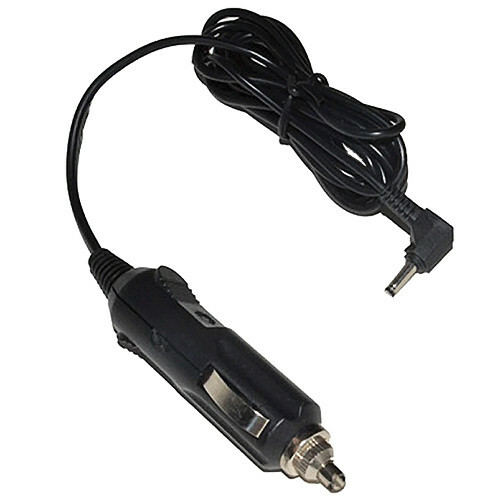 12V barrel connector on one end and a 12V cigarette plug on the other. The LED light's alternate AA batteries don't need to be removed to be preserved upon connecting the LED light to a battery pack. 90-Day Repair & Replace Warranty. Box Dimensions (LxWxH) 3.5 x 1.5 x 1.0"
CLC-125 Cigarette Adapter for LED-125 Camera Light is rated 5.0 out of 5 by 1. Rated 5 out of 5 by Mark from Perfect for battery belt power I use this adapter to power the Bescor light when I need to be positive I'm getting maximum light output. Usually it's the end of the night at a wedding reception, and outdoor send-off, and little to no light. This adapter lets me plug in to a small battery belt and light the night for my videography. The only thing I don't like about it, is that it's sometimes too short for an overhead shot. I am sorry - this manufacturer does not provide these specifications. We do not supply the component parts for this adapter.